On living the urban good life, elsewhere. Or, what bikes and plants can do. We moved to Glasgow from Los Angeles, which many people imagine must have been a difficult move. We did (and still do) miss life by the beach, but I was actually ready to leave Los Angeles’ desert ecology. I love the comparatively moist, vegetal abundance of Glasgow. What I miss more than the beach, is stress-free cycling. Glasgow is a terrible city for cyclists (surprisingly, much worse than Los Angeles, or at least West LA). I won’t get into all the reasons it is so bad here (though the rain and high winds are definitely part of it); what I want to write about is the kind of intangible good that can come from giving bikes more room–actually, of using plants and bikes together to reorganize urban spaces. Most days I ride up Rachel to the George-Étienne Cartier monument at the base of the mountain in parc Mont-Royal, where I turn left and ride downhill into the McGill ghetto. An unnecessary climb, but worth it, not only for the exercise (by the end of my stay I am noticeably more fit!) but also for the view of the mountain, which in the fall, provides a continuously changing spectacle from St-Denis all the way to the park. It is at once inspiring and comforting, since its beauty is a surprise that I remember. 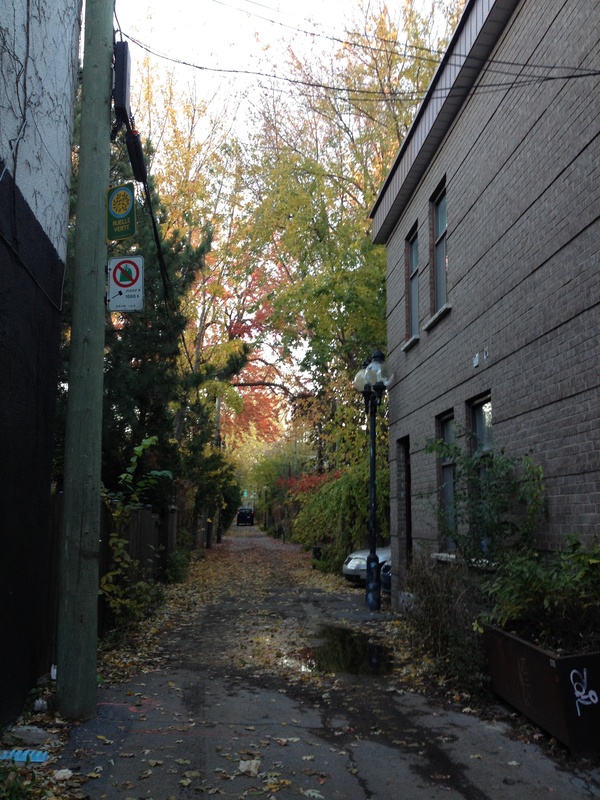 As the leaves change colour, the face of the mountain visible from the street increases in density, each tree showing itself as an individual with its own timeline. It becomes briefly a kind of magical other place that is both within and above the city, and I become much more convinced of its mountain-ness—it seems to grow in size as it gets brighter with colour, and then, once the leaves begin falling, to shrink again, but leaving its topography more clearly visible. By the end of my visit, it stands as a promise of winter’s proximity, and all that entails. I do not, consequently, mourn the leaves’ passing, even though I will leave before the snow comes, and won’t ski or skate or toboggan there even once this year. The mountain so captures my attention, that I barely notice the two rows of planters lining the pedestrian approach to the mountain, which are tall with ornamental ginger and overflowing with annual flowers. The bike path goes around this pathway; the planters are there to mark and beautify a different time—that of walking, and sitting rather than riding. Such plantings appear almost overly indulgent from a bike. Do we really need all this beauty in one place? In contrast, many of the bike paths are planted with trees and ornamental grasses—plants large enough to produce an effect from a distance, or at speed. At the end of November, the grasses make an audible rustling on windy, traffic-calmed streets. From a bike riding through the Plateau-Mont-Royal burough, it feels as if we are actually in a new kind of city. It is not one with which I am in all ways comfortable—I wonder for example, at the effects of the growing disparity in the quality of public spaces across different buroughs of the city—but the way it feels is nothing short of inspiring. We feel healthier, happier—in fact, we are healthier, and we have at least, more moments of pleasure in public. At this stage in my life—with a young child, and a chronic health problem, these are not incidental differences. A good quality of life may help to sell real-estate, and is thus contributing in many parts of the city to a rather remarkable pace of gentrification, but it also makes it easier to be a good parent, to do a good job, and to take care of your health. It is therefore, no small thing to encounter beauty, and to be surrounded by the vitality of other living beings, on a daily basis. I remember asking one of my interviewees if she thought that the enthusiasm for urban agriculture in Montreal was due in any way to the quality of the urban environment and the (often very generous) use of plants in public spaces. Maybe, she said, but pointed out that some of the most interesting projects come out of a lack of action on behalf of the city, because then people have to work out new ways of getting things done. Although I feel somewhat protective of what has been done in the Plateau, for bikes and for plants, I also wonder whether similar effects (of inspiration, health and happiness) might be produced, with less problematic socio-economic implications, through more collective, less institutionalized efforts. But this is of course to imagine another city again—one that does not yet seem quite possible, even here, amongst the tree-lovers, cyclists and alleyway gardeners. People may be healthier here, but many of them are also overworked and underpaid. There is no camaraderie to speak of on the bike paths; it is possible that many of the people who ride up Rachel, towards the mountain with me, do not have time to enjoy the beauty of its changes. This entry was posted in Uncategorized on December 14, 2015 by Erin Despard.